PM Netanyahu meets Shas, UTJ, leaders to discuss next coalition. The heads of Israel's haredi parties on Monday morning met Israeli Prime Minister Binyamin Netanyahu at his Jerusalem home, Kikar Hashabbat reported. 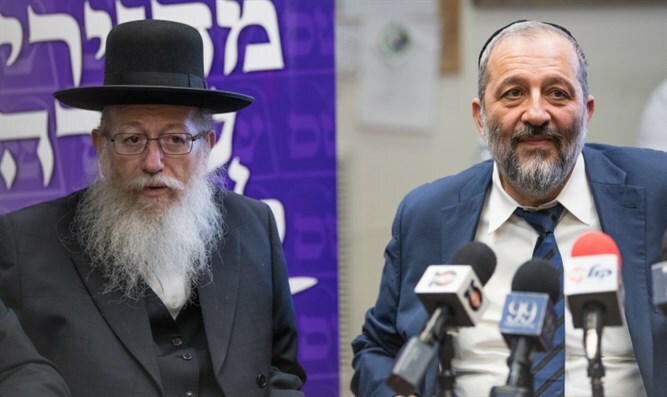 Netanyahu's meeting with Shas leader Interior Minister Aryeh Deri and UTJ's Deputy Health Minister Yakov Litzman came just before the two met with Israeli President Reuven Rivlin to recommend Netanyahu continue in his position as PM. The meeting is believed to have focused on coalition negotiations, including the parties' goal of passing an amended Draft Law within the first month of the next government, and Deri's bill to ban the recognition of private conversions. Former Defense Minister Avigdor Liberman (Yisrael Beytenu) opposes both, and has promised not to join the coalition unless the Draft Law is passed as is. "This was a maintenance discussion," a source told Kikar Hashabbat. "Netanyahu wants to make sure there won't be any surprises."